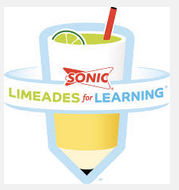 While you are out over the weekend, you can help your child and your child’s classroom by running by Sonic and get those stickers! For every sticker a student brings in, he/she will get a ticket! They love those tickets and I love those Limeade Stickers!! It’s a win win! If you want to stay dry in your house, you can go online and vote or even better donate! Just click on the link below!